In the past two months alone, both Architectural Products and US Glass magazines have directed their spotlights toward Graham Architectural Products (GAP) and the Kean University Green Lane Building project. That’s interesting, since the GAP portfolio of projects spans many building types in many different arenas. But the work we did there seems to have struck a real chord in the industry. For its article “exploring the installation and structural use of architectural sunshades,” US Glass conducted extensive interviews with Fred Grunewald, vice president and general manager of Graham Curtain Wall Solutions, as well as others from the industry. 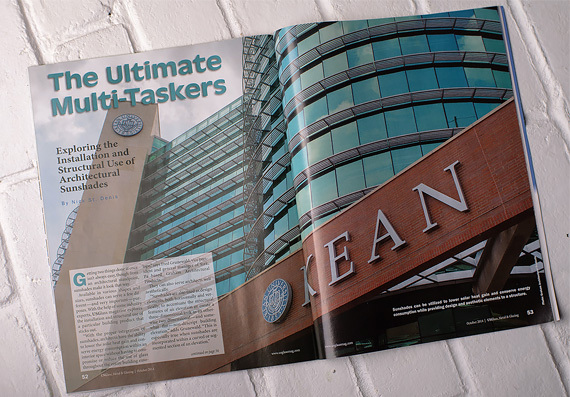 The result is an informative article helped immensely by Fred’s insight and a striking two-page photograph of the Kean building – one that offers indisputable proof of how GAP insight can pay off in the finished product. Check it out in the October issue of US Glass. And if you would like more information on Graham Architectural Products or Graham Curtain Wall Solutions, contact Jim Eisenbeis, Graham’s director of marketing & project management, at his office, 717-849-8119, on his cell phone, 717-659-0154, or via email, jeisenbeis@grahamwindows.com.